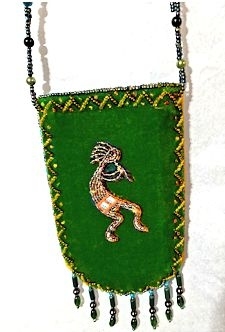 This beautiful hand beaded medicine bag features Kokopelli. It measures 3 3/4" x 6" (9.5 cm x 15.2 cm). The inside is lined with satin and has a velcro closure. The beaded strap is 42" (106.7cm). Also called a "possible" bag, as it is possible to carry your Iphone, Ipod, smart phone or many other items in it. This product was added to our catalog on 06/24/2018.